The ketogenic diet has made a name for itself as one of the go-to diets to try. Keto diet meals are made up of high fat, low carb foods that offer many benefits to your overall health, including weight loss, and fighting against diseases like cancer and diabetes. Many keto diet recipes feature meat and cheese, but it’s totally possible to do the keto diet as a vegan. In this post, we’re breaking down a 21 day meal plan for a vegan ketogenic diet. Is there a keto diet plan for vegans? Yes, there are plenty of keto recipes for vegans! A ketogenic vegan diet is made up of lots of delicious chia puddings and porridge recipes, healthy soups and of course, lots of veggies. We’ve rounded up 21 days of breakfasts, lunches, dinners and snacks, so you can follow the keto diet without eating meat or any animal byproducts. The goal behind the keto diet is to get your body into a state called ketosis, and this is done by eliminating carbs. When carbs are present, glucose is the body’s main source of energy. But when carbs aren’t there anymore, the liver takes fatty acids in the body and converts them to ketones as an energy source. To lose weight with a high fat vegan diet, the key is to cut as many carbs as you can to get your body into ketosis. 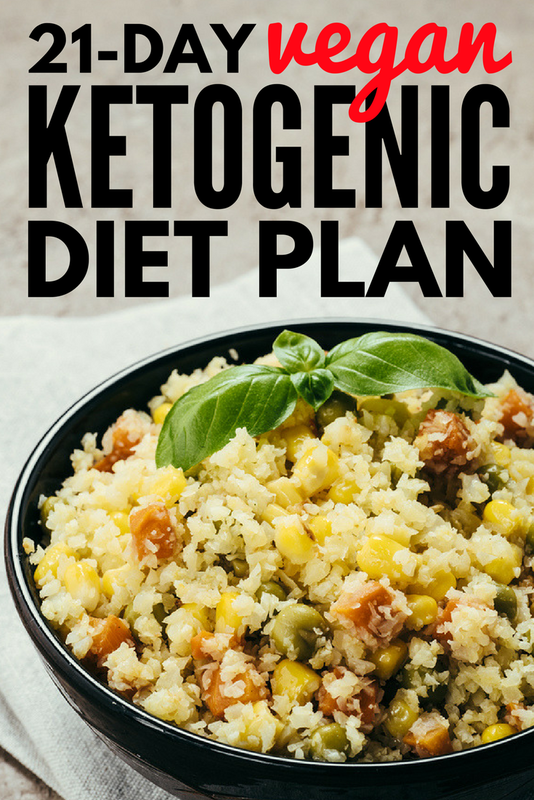 There are lots of ketogenic diet recipes for vegans, and we’ve compiled at 21-day plan just for you. These recipes prove that you don’t have to deprive yourself in order to lose weight and get healthy. From fluffy vanilla waffles and cauliflower hash browns for breakfast, to peanut shirataki noodles and keto curry noodle bowls for lunch, and vegetarian lettuce wraps and sesame tofu eggplant for dinner, this 21-day vegan keto diet plan is completely mouth watering!